The critically acclaimed St. Vincent came to Cleveland as a highly touted performer and left looking like a rock goddess. The House of Blues in Cleveland was the site of some serious shredding Tuesday, Sept. 30 when St. Vincent and Sondre Lerche visited the rock 'n' roll capital of the world. Originally scheduled in Cleveland this past spring to promote her fantastic latest album, the show was rescheduled after Annie Clark, the woman behind St. Vincent, performed with the surviving members of Nirvana as part of the Rock 'n' Roll Hall of Fame Induction. Needless to say, she and Lerche certainly made up for the delay. Lerche started the evening off with a solo set, the first since the release of his rather enjoyable new album Please. The Norwegian offered up plenty of of tracks off the new new release between some playful banter, with standouts such as set opener "Legends" and the twitchy "Bad Law," adding in some juicy, fuzzed-out guitar licks to balance out his charming pop. Lerche didn't need much convincing to get the sold-out crowd to join in for a sing-along on the bouncy "Two-Way Monologue" from his 2004 album of the same name and offered up quite a jam session from fan favorite "Sleep on Needles." After Lerche left the stage to much applause, the crowd began to buzz for St. Vincent. Before long, Clark and her crew of musicians marched out and ripped straight into the excellent "Rattlesnake" from her latest release. Clark often mesmerized the crowd with her performances - both musically and in terms of presentation - while her band capably completed the sonic textures she's weaved since her 2007 debut album Marry Me. Roughly half of St. Vincent's set comprised of songs from her latest album, treating the audience to the digitized glory of "Birth in Reverse" and "Digital Witness," both with appropriately robotic dance moves. Clark also sprinkled in wuite a few numbers from her earlier albums, including the cooing "Cruel" and the splendid "Cheerleader" from 2011's Strange Mercy. Clark has always possessed a sort of alien quality to her, with her music possessing an alluring mix of glitchy grittiness and gorgeous qualities and her show's very much acting as a artisitic performance instead of just a "show." By the time Clark completed the searing final half of St. Vincent's "Huey Newton," however, the only thing the crowd could see her as was a silver-haired rock goddess. Even after that moment, Clark saved the best for last, closing off the show with a thundering extended performance of Marry Me's menacing "Your Lips are Red," encapsulating the crowd with heavy sonic walls of shrieking reverb from the stage. 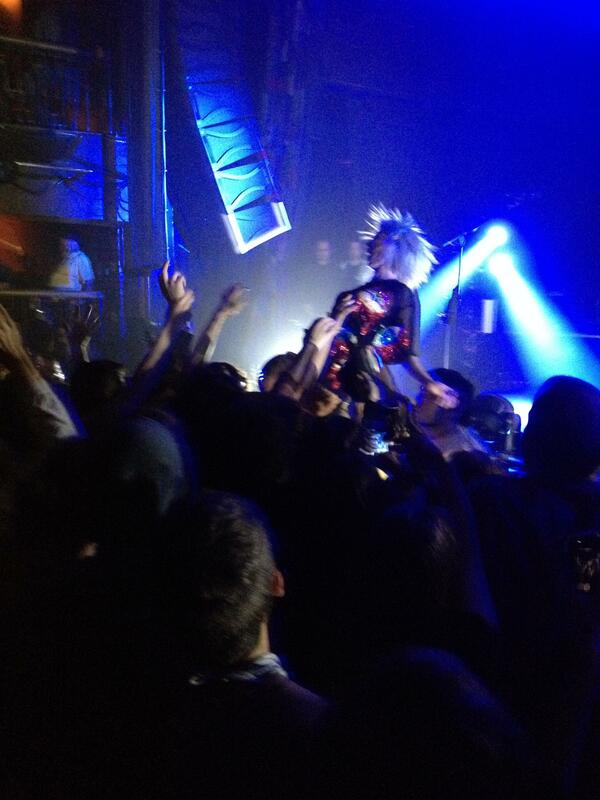 Halfway through the song, she hopped on the shoulders of a security guard and proceeded to shred on her six-string before allowing part of the audience to take control of her guitar, resulting in a chaotic blast from the speakers that somehow fit the rest of St. Vincent's frenzied finale. Even after that jaw-dropping display, Clark retrieved her instrument and continued to finish the song with yet another searing solo. It was a fantastic end to an impressive display, and one that helped solidify St. Vincent and Sondre Lerche as some of the best live acts in music today.